What Made Sir Sydney Nolan So Popular? Nolan's Australian landscapes captured the untidiness of the outback and arid desert wilderness. He superimposed 'portraits' of rogues, bushrangers and castaway personalities. There is a great deal of intrigue surrounding the life of Sir Sydney Nolan. 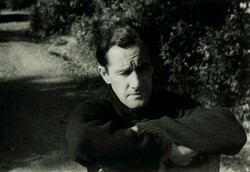 Together with Patrick White, he was able to open up the International art market to raw and real Australian bush myth. Much of the intrigue and devastating tragedy of the stories he told reflected some of the traumas of his life. His daughter was fond of saying, "Like the good old Irish riddle which asks, "What is Irish Dementia like? The answer is "The only thing they remember are their grudges!" Nolan's work was raw and honest in its complexity. It is that honesty which captures the heart of the Australian people. Fiercely loyal, possessive and jealous - his work stands out against the shallowness of the present Australian condition. Australia grew up and as a convict nation. Larikanism has always bubble beneath a cool Australian exterior which always seems to mask up as identifying with the aggressor when in fact each and every Australian suppresses a touch on rebellion and cheekiness. Three of the stories that Nolan chose to explore through painting were the Legend of Ned Kelly, (twice) the story of the escape of Mrs Frazer and the tragic nature of the Burkes and Wills Expedition. Each one of these stories unveils the harshness of the process of early Australian settlement. When European Australians settled Australia they found it necessary to either subdue or eradicate the First People who lived here. To this day the politics of this situation reverberates through the very fabric of Australian society. Like all countries that have been built by dispossessing their first people, slums have been created by removing people to reservations. Like all other countries caught in the aftermath of this unfortunate way of dealing with invasion, there was a process of disremembering. There was also a process of mythic glorification that acted as to manufacture a kind of social amnesia. Somehow amongst this fabric of selfprotection and aura of Australia 'marking the spot' of the great "Fair Go" arose. Nolan's work is cryptic. It unmasks layers of self deception and presents Australia in "The Raw". Sydney Nolan painted two whole series based on the theme of Ned Kelley, his capture and trial. Ned Kelly was eventually executed for exploits that took place over a period of time. He ranged as a bush outlaw rustling horses. (Among other things). It is intriguing that to the Australian psyche, the outlaw is still seen as a hero of sorts. What could justify making a person who terrorized the countryside into a hero? The mythic situation had that raw and odd aura surrounding it because it was perceived at the time that he had been forced to rebel against an unjust system. Like Robin Hood, Ned Kelly (was said to have) robbed from the rich who he perceived as having the law stacked on their side and treated the poor in a fair and gentle manner. But like all clashes with the law the situation escalated and he eventually was captured at a shoot out at Glenrowan in 1880. It is the creative tension emanating from the story that Nolan turned into iconic material. Rather than just concentrate on the struggle of life, Nolan was trying to create episodes of Australian nationalism. For better or worse, Nolan painted Ned Kelly as hero, a metaphor for humankind. In truth it doesn't really matter what he intended because the paintings act as a question not as an answer. By the very act of painting the iconography, Nolan has begged the question who was ned Kelly within the confusingly complex fabric of Australian settlement. Against a very harshly painted background, Nolan painted Kelly as a dogged fighter, and also as a victim, and consequentially as a hero. He parodied war and used Kelly as a way to exemplify resistance to tyranny and a liberational attitude to freedom. Look at the way Kelly folds his arms at his trial. This is not a picture of a penitent sinner! Nolan became an Internationally acclaimed artists because his narratives were integrated into the outback landscape, thus affording people from overseas a glimpse of Australia that uniquely presented the raw countryside. This was no stylistic imitation of the way Europeans painted. He was able to give the audience an insight into the 'mythical' history of Australia and at the same time reveal the beauty of the Australian bush. His landscapes captured the inevitable way that the harshness of settlement of Australia influenced the customs, aspirations and behavior of Australians. His landscapes were a balance of the synthesis between harmony of legend, symbol and the visual impact of the colourful Australian landscape. Although Kelly is in the central motif, twirling as a leitmotif reiterating through many, many paintings, the stark figure of Kelly in his tin can hat operates almost as a reversal of chiaroscuro. The stark black tin can shape draws the viewer to the painting and acts to highlight the colours all around the icon. This is a story of failing leadership and a large dose of bad luck. With both of their leaders five other travelers lost their lives. One sole survivor, John King, crossed the continent ad made it back alive to Melbourne. All of the myths that Nolan explores have a haunting theme of poor leadership and an aberrant recklessness that cost lives. And yet, if the Australian wilderness had not been explored Australia as we know it would not exist today. Many artists and authors have drawn attention to the plight of travelers in the bush. It only takes a small mistake of navigation even now and a lone traveler can become hopelessly lost. Whilst the story of Eliza Fraser doesn't sound like it could possibly be true, it is at least in part a real story of hardship, misfortune, abuse and betrayal. It is the one other great Australian myth explored by Nolan. It is said that Nolan used the story in a cathartic manner. This does seem to be true and he obliquely supported this theory before he died. There seems to be no real reason why we should be prying into the brilliant artist's private life. He suffered great personal hardship throughout his life. One of these traumas involved the suicide of his second wife. What we can make of this background personal material about Nolan's personal life, is that he was human and that the people in his life were also prone to foibles and blunders. Some of the women in his life have been posthumously charged with manipulation, possessiveness and betrayal. Perhaps they were like this? Perhaps Nolan was as self absorbed as any other great painter? It is rare for great artists to mange totally fulfilling relationships. They must plough so much of their energy into their painting. Painting is not only about research it is also about expressively creating with soul. This is an isolated and lonely experience. The Art World expects so much from creatives whilst at the same time judging, shaming and blaming them when they attempt to deliver. All we really need to know about this artists personal life is that he reflected his own emotional battles in his paintings by reframed context ad working with the psychological material intuitively. Through this process of catharsis he captured the dangers, deceptions, betrayals and harshness of the Australian landscape as a backdrop for the same phenomena in real life. He was ale to eventually synthesize the two parallel dynamics so that his canvas screamed with energy and dynamic tension. Edit Piaf's birth name was Édith Giovanna Gassion and she was born in Belleville, Paris in 1915. Edith first began her singing career busking in the street. No one will ever know what happened? Like many other great artists, Sidney Nolan turned to abstraction in later life. Through this mode of expression, he was able to capture 'resolution'. He travelled the world capturing the landscape and through a very long prolific process was able to synthesize all that he saw so that his canvases emanated peace and tranquility. Somehow in this process, he did not lose energy but enthused energy, vigor and vitality through these beautiful images. Australians have a lot to be grateful to Nolan for. Sidney Nolan introduced Australian painting, and through it the Australian landscape to the International arena. More importantly, he introduced Australians to a debate about the construction of their own identity. In this Post Colonial Post- Post Modern world understanding the Australian psyche and talking with them about their recollection (re-remembering) of their past become essential. Through this understanding we can come to terms with the injustices we still see all around us today. Maybe through this understanding, we will be able to comes to grips with the way other 'immigrants' who come to our shores in boats are treated? Our behavior and attitude has to change with the times. Maybe the recent revival of interest in Nolan's work has come about for this very reason. By the time he died Nolan was as resolved and integrated as was the best of the International crowd. Paul Signac had a propensity to systematize everything within his arts based practice. That is why he was the ideal artist to be at the forefront of the Pointillist movement.